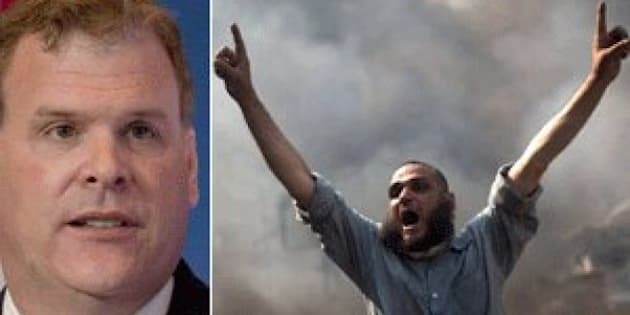 OTTAWA - Foreign Affairs Minister John Baird says he's concerned about attacks on religious institutions as deadly violence continues to flare in Egypt. But so far, Canada has not imposed any sanctions against the interim government in Cairo following a military crackdown against supporters of ousted Egyptian president Mohammed Morsi. In a statement, Baird and Andrew Bennett, Canada’s ambassador for religious freedom, call attacks on Christian-based churches in Egypt unconscionable. And they say Egyptian authorities need to protect worshippers. "We are concerned by recent attacks on religious institutions in Egypt, in particular the unconscionable attacks on Coptic Orthodox, and Anglican churches, and on Baptist and Franciscan institutions," the statement reads. "Attacks on places of worship are unacceptable. Canada calls on Egyptian authorities to protect worshippers and religious sites from violence and intimidation." Egypt's ambassador to Canada, Wael Ahmed Kamal Aboul-Magd, was unavailable Thursday to respond to Baird's statement. His assistant said the ambassador would not be back to the embassy until the weekend. Foreign Affairs posted on its website that the embassy would be closed until further notice and it also advises Canadians not to travel to Egypt, with the exception of Red Sea coastal resorts. But the embassy posted a statement on its website from the Egyptian foreign affairs ministry, expressing sorrow over the loss of life in Cairo, and condemning several countries for statements that it suggested infringe on its sovereignty. "While it endeavoured to clear Rabiaa El Adaweya and Al-Nahda sit-ins in a peaceful manner to avoid casualties among citizens of the homeland, the Egyptian government expresses its deep sorrow and regret for (the) victims as the Egyptian blood is precious and must be preserved and not be shed," the statement read. The ministry also condemned remarks made by Turkey's prime minister, who called for intervention from the UN Security Council and League of Arab States to end the bloodshed in Egypt, along with statements reportedly made by a spokesman for Qatar's foreign affairs ministry. "While observing the external world's concern on the latest developments in the country, the ministry ... expresses its strong condemnation and denial of some statements of several foreign countries and bodies, which exceeded the mere expression of this concern." The crackdown on Muslim Brotherhood protesters, which began Wednesday, has killed more than 500 people. In light of the violence, the United States has cancelled joint military exercises with Egypt that were scheduled for next month. The army took power from Morsi, a top Muslim Brotherhood official who became Egypt's first democratically elected leader a year ago after the ouster of long-time president Hosni Mubarak. On Thursday, U.S. President Barack Obama cancelled scheduled joint military exercises with Egypt and said the United States "strongly condemns" the violent crackdown. America's traditional co-operation with Egypt "cannot continue as usual while civilians are being killed in the streets," Obama said. It was the president's first statement on the rapidly deteriorating situation in Egypt, but he stopped short of describing the Egyptian military's recent takeover as a coup — a designation that would cut off more than $1 billion in U.S. aid a year.